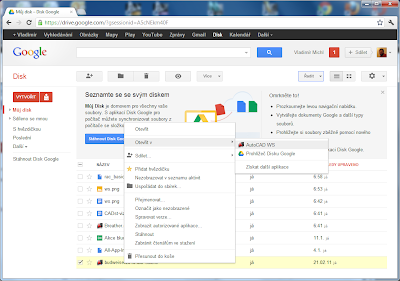 Yesterday, Google released its long awaited cloud disk - the web service "Google Drive". Other providers of cloud storage services have quickly refreshed their offerings so you can new e.g. upgrade your storage space to 25 GB in "Microsoft SkyDrive". Besides the storage capacity for your documents (currently 5 GB), Google Drive offers a number of application services - viewers for about 30 file types (office formats, pictures), OCR functions, searching (of course), sharing, versioning, plus the neccessary synchronization tool for your local computer (Windows, Android). An interesting feature for CAD users is support of DWG and DXF files announced on Google Drive launch. This feature is based on cooperation between Google and Autodesk - it connects the cloud CAD application AutoCAD WS with the file storage in Google Drive. By simple installation of "AutoCAD WS" app-extension in Google Chrome (Google Drive > Settings > Manage applications) you can learn both web apps to cooperate. Any DWG drawing uploaded to Google Drive can be then opened, edited or printed in AutoCAD WS just by clicking on it in the Google Drive web interface. Similarly you can connect another Autodesk web service - the picture editor Pixlr. The Autodesk's own cloud storage - Autodesk 360 - offers the capacity of 25 GB for each license of Autodesk product under Subscription. Success of the individual cloud storage services on the market will be driven by their capacity, reliability, but first of all by the portfolio of their application functions, plus by their synchronization functions for local computers (at least till people will use any local computers). 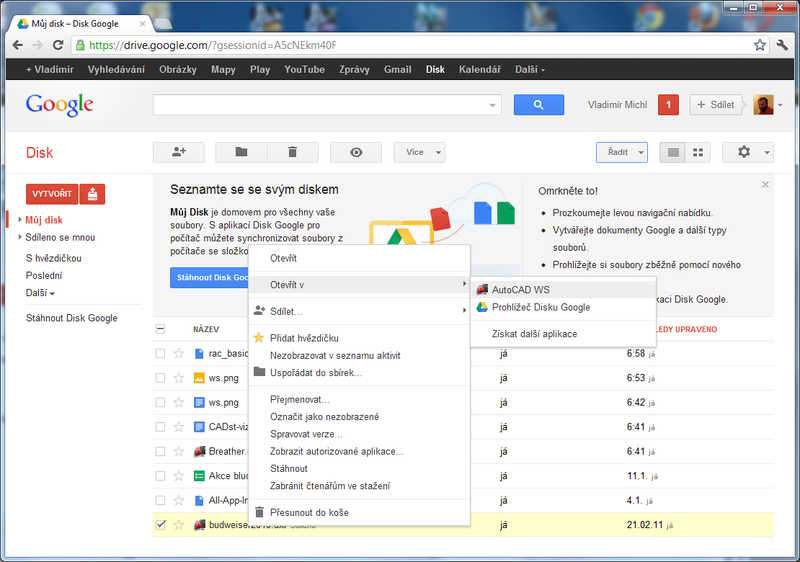 You can run Google Drive from drive.google.com.